Geographers often refer to the landmass that includes India, Pakistan, and Bangladesh as the Indian subcontinent. A wall of the highest mountains in the world—the Hindu Kush, Karakorum, and Himalayan ranges—separates this region from the rest of the Asian continent. Rivers, Mountains, and Plains The world’s tallest mountains to the north and a large desert to the east helped protect the Indus Valley from invasion. The mountains guard an enormous flat and fertile plain formed by two rivers—the Indus and the Ganges (GAN•jeez). Each river is an important link from the interior of the subcontinent to the sea. The Indus River flows southwest from the Himalayas to the Arabian Sea. Much of the lower Indus Valley is occupied by the Thar Desert. Farming is possible only in the areas directly watered by the Indus. The Ganges drops down from the Himalayas and flows eastward across northern India. It joins the Brahmaputra River as it flows to the Bay of Bengal. The Indus and Ganges and the lands they water make up a large area that stretches 1,700 miles across northern India and is called the Indo-Gangetic Plain. Like the Tigris, the Euphrates, and the Nile, these rivers carry not only water for irrigation, but also silt, which produces rich land for agriculture. Plateau. The plateau is framed by low mountain ranges called the Eastern and Western Ghats. These mountains keep moist air from reaching the plateau, making it a dry region. A narrow border of lush, tropical land lies along the coasts of southern India. Monsoons Seasonal winds called monsoons dominate India’s climate. From October to February, winter monsoons from the northeast blow dry air westward across the country. Then, from the middle of June through October, the winds shift. Environmental Challenges The civilization that emerged along the Indus River faced many of the same challenges as the ancient Mesopotamian and Egyptian civilizations. Yearly floods spread deposits of rich soil over a wide area. However, the floods along the Indus were unpredictable. The rivers sometimes changed course. The cycle of wet and dry seasons brought by the monsoon winds was unpredictable. If there was too little rain, plants withered in the fields and people went hungry. If there was too much rain, floods swept away whole villages. 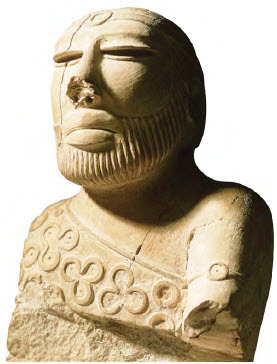 Historians know less about the civilization in the Indus Valley than about those to the west. They have not yet deciphered the Indus system of writing. Evidence comes largely from archaeological digs, although many sites remain unexplored, and floods probably washed away others long ago. At its height, however, the civilization of the Indus Valley influenced an area much larger than did either Mesopotamia or Egypt. Earliest Arrivals No one is sure how human settlement began in the Indian subcontinent. Perhaps people who arrived by sea from Africa settled the south. Northern migrants may have made their way through the Khyber Pass in the Hindu Kush mountains. Archaeologists have found evidence in the highlands of agriculture and domesticated sheep and goats dating to about 7000 B.C. By about 3200 B.C., people were farming in villages along the Indus River. 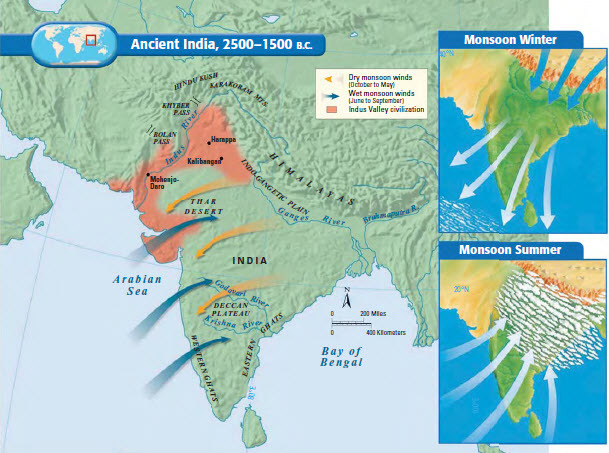 were Kalibangan, Mohenjo-Daro, and Harappa. Indus Valley civilization is sometimes called Harappan civilization, because of the many archaeological discoveries made at that site. sun-dried mud bricks of the Mesopotamians. Early engineers also created sophisticated plumbing and sewage systems. These systems could rival any urban drainage systems built before the 19th century. The uniformity in the cities’ planning and construction suggests that the Indus peoples had developed a strong central government. platforms to protect it from flooding. A thick brick wall about three and a half miles long surrounded it. Inside was a citadel, which provided protection for the royal family and also served as a temple. The streets in its grid system were as wide as 30 feet. Walls divided residential districts from each other. Houses varied in size. Some may have been three stories high. Narrow lanes separated rows of houses, which were laid out in block units. Houses featured bathrooms where wastewater flowed out to the street and then to sewage pits outside the city walls. Harappan culture spread throughout the Indus valley. Like the Egyptian and Mesopotamian civilizations you have studied, the culture was based on agriculture. Artifacts help to explain some aspects of the culture. seem to be combined into words. Culture The Harappan cities show a remarkable uniformity in religion and culture. The housing suggests that social divisions in the society were not great. Artifacts such as clay and wooden children’s toys suggest a relatively prosperous society that could afford to produce nonessential goods. Few weapons of warfare have been found, suggesting that conflict was limited. The presence of animal images on many types of artifacts suggests that animals were an important part of the culture. Animals are seen on pottery, small statues, children’s toys, and seals used to mark trade items. The images provide archaeologists with information about animals that existed in the region. However, some of the seals portray beasts with parts of several different animals—for example, the head of a man, an elephant trunk and tusks, horns of a bull, and the rump of a tiger. As in the case of the Harappan language, the meaning of these images has remained a mystery. the bull. All of these became part of later Indian civilization. Trade The Harappans conducted a thriving trade with peoples in the region. Gold and silver came from the north in Afghanistan. Semiprecious stones from Persia and the Deccan Plateau were crafted into jewelry. The Indus River provided an excellent means of transportation for trade goods. Brightly colored cotton cloth was a desirable trade item since few people at the time knew how to grow cotton. Overland routes moved goods from Persia to the Caspian Sea. The Indus River provided a link to the sea. This access allowed Indus Valley inhabitants to develop trade with distant peoples, including the Mesopotamians. Seals probably used by Indus merchants to identify their goods have been found in Sumer. Ships used the Persian Gulf trade routes to bring copper, lumber, precious stones, and luxury goods to Sumer. Trading began as early as 2600 B.C. and continued until 1800 B.C. Around 1750 B.C., the quality of building in the Indus Valley cities declined. Gradually, the great cities fell into decay. The fate of the cities remained a mystery until the 1970s. Then, satellite images of the subcontinent of India revealed evidence of shifts in tectonic plates. The plate movement probably caused earthquakes and floods and altered the course of the Indus River. Some cities along the rivers apparently suffered through these disasters and survived. Others were destroyed. The shifts may have caused another river, the Sarswati, to dry up. Trade on this river became impossible, and cities began to die. Harappan agriculture, too, would have been influenced by these events. It is likely that these environmental changes prevented production of large quantities of food. Furthermore, Harappan agriculture may have suffered as a result of soil that was exhausted by overuse. This too, may have forced people to leave the cities in order to survive. Other factors had an impact on the Indus subcontinent. The Aryans, a nomadic people from north of the Hindu Kush mountains, swept into the Indus Valley around 1500 B.C. Indian civilization would grow again under the influence of these nomads. At this same time, farther to the east, another civilization was arising. It was isolated from outside influences. The bearded figure above might be a Harappan god or perhaps a priest king.